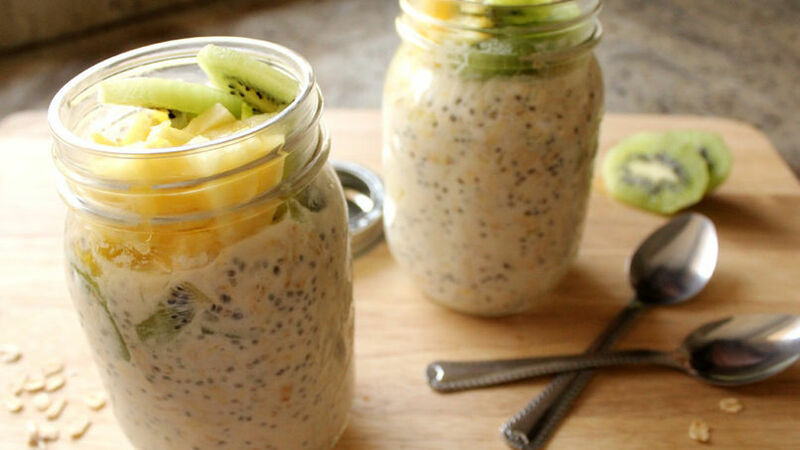 In a bowl, combine oats, Greek yogurt, chia seeds and milk. Mix the ingredients and serve in two glass bowls. Cover and refrigerate overnight. In the morning, chop the pineapple and slice the kiwi. Divide the fruit into the two bowls with the oatmeal. Serve and enjoy this delicious and nutritious breakfast! Oatmeal can be refrigerated up to 3 days. Mornings at our house can get very busy. That's why I love to have foods that allow me to start the day with lots of energy. The solution for those days is this breakfast made with oatmeal, yogurt and fruits that I make the night before. The only thing I have to do in the morning is add the fruits and it’s ready to serve. Simply delicious!